I'm so honored to have been on The Many Shades of Green radio show for another interview with Maxine Margo. This week, Maxine and I talk post-consumer recycling, BTB feng shui, environmental psychology and more on the path to zen. Click here to listen to our newest interview on The Many Shades of Green. Hi, I'm Anjie Cho, registered architect and LEED AP, and this is Holistic Spaces, brought to you by The Many Shades of Green. Today I’d like to talk to you about an exciting topic: post-consumer recycled materials. It’s actually pretty confusing – what does recycled mean? What does post-consumer recycled mean? What’s the difference? Post-consumer recycled content indicates that a portion of the content is made from recycled materials that you or I put in our recycling bins through private or public means. That means this material has gone through the hands of a consumer. Otherwise, just “recycled” means that it was likely made from virgin material such as leftover scraps from factories and over-produced items. Why post-consumer recycled? When you recycle, it eventually needs to be purchased by someone to recycle. If people like us are purchasing post-consumer recycled products, we create a market demand for those post-consumer materials. Sadly, if there’s no market for the recycling, all the material we recycle may just end up in a landfill. Also it wouldn’t hurt to have a good percentage of the paper and plastics that already exist to be salvaged and reused for post-consumer recycled products. In conclusion, I encourage you to make a choice for post-consumer recycled materials whenever possible. By creating a market and demand for post consumer recycled products, we can support and grow the infrastructure for more environmentally GREEN living! MMR: Hi, I’m Maxine Margo Rubin, and welcome to The Many Shades of Green, our program that engages in conversations that move to raise your eco consciousness. My guest this week on The Many Shades of Green is Anjie Cho, founder of Holistic Spaces. She’s a LEED certified green architect, a BTB Feng Shui Practitioner. She has written a new book entitled 108 Ways to Create Holistic Spaces. How do you create functional, sustainable and balanced spaces within your home by using Feng Shui techniques? What steps can you take to enhance the flow of chi? Anjie will give us some ideas and green tips that will make your home more harmonious and set you on a path to Zen. So Anjie, how are you? AC: I’m so good Maxine. How are you? We’re on that path to Zen right now. We’re going to get in to your book in a little bit, but I wanted to get in to Feng Shui right off the bat. It didn’t come in to the States until about the ‘60s, is that right? I read that in one of the paragraphs in your book that I actually read, yes. My mentor must have written that. Yes, it came in to the ‘60s and it got popular in the ‘70s and ‘80s through professor Lin Yun, who is the founder of the BTB Feng Shui School. Now BTB Feng Shui, how does that differ from another form of Feng Shui, other areas of it? There are many schools of Feng Shui. There’s BTB Feng Shui, there’s the Compass School, there’s Classical Feng Shui, there’s Form School. There are a lot of different schools, and also every culture has their own form of geomancy, which means looking at the land and the space and the environment and seeing how to best locate yourself. So the difference with BTB, generally, is that it’s more of a westernized approach to Feng Shui. It’s more recent, and there are 2 main characteristics. It doesn’t really prioritize the cardinal direction, for instance north, south, east, west aren’t the most important thing. What’s more important is where the energy comes into the space, so that would usually be the front door. We call that the mouth of chi. The mouth of chi is the front door of an apartment or a house. So when you walk in, you’re going to feel in a particular way because of the energy or the way things are placed or what’s in your house. What would you want to have in your front entrance that will make you feel the energy is positive? Well, the front entry is the first thing that you see. Even if you live in a house that has a garage and you come in through the garage door, your front entry represents your face to the world and how the world sees you and the first thing that people see. So that symbolism says a lot about how opportunities come to you, how the world sees and views you. So some simple things that can improve the energy of your home looking at your front entry…one is to brighten it up. Make sure that the bulbs you have there are very bright. You have the opportunity to bring a lot of brightness in that space. A light bulb represents fire energy. Another thing is to keep it very clean and tidy, By keeping it clean and tidy, you automatically watch what’s happening in that space. You’re mindful of that space; you pay attention to it on a daily basis. Another thing that you can do is make sure that your door can be found. A lot of times, especially in New York City apartments, you don’t even know how to buzz the front door. There’s no buzzer, there’s no number. If your friends can’t find you, how can opportunities find you? Yeah, if your friends can’t find you, you’re definitely in a bit of trouble. Now, you mentioned tidy, and I know there’s a lot of different thoughts about tidy. They say geniuses have clutter and then they create through their clutter, I mean, or the clutter just builds up around them but they still can focus. Yet clutter also can present problems in terms of how you’re organized, how your life is, so if something’s cluttered, do you need to work on it forever? Are there steps you can take to start doing it in increments and what is behind that theory of de-cluttering your space? Right, that’s where my genius reference came in. Thank you Einstein. Those were actually two extremes. If you have a very cluttered desk where you can’t find anything, of course that impacts how well you work, how clearly you think. But if you have an empty desk, and nothing is going on, then it also means that there’s also nothing going on in your mind, nothing going on in your work, you don’t have anything happening, so that we would say it’s very yin. So you need balance, actually. You need to be in the middle. Maybe it needs to be a process of clutter and removing. Because maybe if you take snapshots of the desk at certain times, it might look cluttered, it might look empty, but life isn’t static like that. We’re constantly moving. So when you approach clutter in your home, I think the first thing to think about is: is it really representing a block in your life? Is it really causing angst in your life? For instance, for a while, I had a lot of magazines piling up, and every time I saw them, I thought, “Those magazines that I keep meaning to read and I’m not going to read and they keep piling up.” It becomes a source of guilt and it weighs on you, and that takes up a lot of energy to ignore that. So if it’s representing a block in your life, then it’s definitely something you should address but if it’s not bothering you, you don’t need to worry about it. I have that with mail. It just piles. The mail I need, I address. The mail I don’t need, which is from anything and any place, it just stays there. We started keeping mail in the mailbox that we didn’t want to bring in, or mail that we didn’t need to address, certain catalogs, certain things. I think we drove our mail lady crazy. Sorry! But again, the clutter issue is definitely a problem, and achieving that balance is the way to go. Well, there’s that one approach where you only handle it once. Like for your mail, if you touch it, you need to deal with it. So make sure you only have to deal with it one time, so if you touch it, you throw it away or you address it. That’s one way to approach it. And also it’s okay, like I said, it’s okay to have some clutter. For instance, my sister has 2 daughters and she has a table that’s her homework table. It’s a clutter table. You just throw everything on there, and you make a space in your life to accommodate things that are messy and that you can’t address right away. So maybe it goes in that area and eventually, you clean off that area when you got sick of it. In achieving this balance, also, it’s, I think, important (and I read) that you take time to meditate and have some space to do that, and if you have a little tiny apartment in New York City, a studio, I mean, how do you figure spots to do that? I mean, where would you go in such a small space? One of my meditation teachers, he says it’s really great to have a spot that you always go back to. For instance, if you had to make your bed area, for instance you have to create a bed every time you went to sleep, it would be very challenging, and you might just sleep on the floor sometimes. So same thing with meditation; if you don’t have a designated spot, you may not do it very often, because it’s not there. I hear you’re saying, not a lot of people have room, but the space could be while you’re sitting at the edge of your bed, or it could be sitting on your sofa or could be sitting at your desk, because when they talk about space and meditation, it’s not just physical space but also creating space in your mind and creating space between your thoughts and creating space within yourself. There’s so much stress, and I know people do not take time to meditate which is something they should do. How would you get the message across the people to take that time and as a part of the Feng Shui practice to do that and how would they do that? What message would you tell them? Well I feel that meditation is definitely an important thing to incorporate in your life, but if you’re not called to do it, maybe that’s not the right thing for you. But if you are called to it, you could go take a class at a meditation center. I go to Shambhala center, and they’ll teach you ways to incorporate it in to your life. I think one of the biggest benefits of meditation for me, is that I rarely take the time to be compassionate enough to myself to give myself a break and just be present and think. I’m always thinking about the next thing I need to do or the next person I need to take care of or the next meal I’m going to have, and that’s all okay, but if I can sit down and just be with my thoughts, then I can let all those thoughts happen and absorb them and watch them, then it creates space in my mind to really be able to focus on things. Otherwise my mind just, without the meditation, your mind just becomes like a wild animal. Right. Well, people need to take a chill time in their crazy workday, and it’s kind of hard to do, but maybe even connecting to nature, go outside, go to a park. I know there’s eco-psychology which is something that seems to be sprouting up, and again, I saw that in the book, a reference to it. What is that about? There’s one book I was reading where there have been some studies done where people are in hospital spaces, and they heal faster when they see green space or they have access to green space. You can start to see that someone’s actually healing when they begin to look outside of themselves and worry about things besides themselves, so maybe about their environment. So one of the amazing studies they did was, I think they studied the same amount of people with the same surgery, and the ones that had a view to green space and trees healed much faster, and they needed fewer pain killers than the other group. Wow. So the people who saw greenery felt better even looking out a window, not necessarily being outside, but just seeing it, and the people that didn’t weren’t healing as fast. So that really shows you that we need to get outside, and we need to have space outside. Now, how could you bring some of that green inside? We’re going to get to that in the next half now. We’re really going to get green in the next half, because I want to hear all these shades that I don’t even know about. Well, you can definitely bring in some plants, and not just small, little, dinky forage plants but bring in a big, 3 foot fern or ficus tree or something. Bring in some living plants. Not only does that bring greenery in to your space, it improves the air quality, and it improves your ability to take are of something outside of yourself. It works in a lot of ways. And also bringing in the color green, because the colors of nature are much more soothing to the eye. We’ve just evolved that way, and that’s another thing that these environmental psychologists have studied: how colors affect our eyes, how it affects our wellbeing and our emotions. So we’re going to talk about more green because I’m very interested in various shades of green, or the many shades of green. We’re here with Anjie Cho. We’re talking about green things and Feng Shui and the relationship with color and space and energy. There’s something called the bagua map which has 8 trigrams. We’re going to learn now what that is, and then we’ll focus on some of the colors, one of them being one of my favorites, well, my favorite color, which is green. So can you give us a little background on that bagua map? Sure. The bagua map is the Feng Shui map, and it’s a conceptual grid. It’s a 3 by 3 grid, and it creates 9 different areas, although there are 8 trigrams, but that’s for another conversation. The 9 areas represent 9 different areas of your life, and it has different connections. For instance, the first one we’ll probably talk about is new beginnings, which is related to green, and it’s related to wood, the element of wood. It’s related to a certain area of your home, it’s related to family, it’s related to the spring. It’s also related to Chinese medicine, the meridians. They also use the 5 elements in Daoism; it’s the same thing. What are the 5 elements again, so the people know? The 5 elements are wood, fire, water, metal and earth. Okay. There’s a group called Earth, Wind and Fire so they’re pretty close. … the metal. They’re a metal group, right? They use metal, right. So in terms of the colors and the numbers, there’s a number associated with each color as well. So let’s start with green. Also, how many shades of green are represented? Tell me about that. … a redwood, yeah! That deep dark green relates more to knowledge. The greens, in general, are all very healing and supportive, because the color is really comforting to us, and it also reminds us of growth and trees and expansion and change and moving on to a better place from where we are now, so it represents new beginnings as well. New beginnings and plants and trees and grass, but there are also blue-green waters. There are deep green waters, so that’s another thing. That’s a flow. You need water for anything to live. So is there a water sign? Is there a water color? Is there a water number? Well actually, green and blue are both related to wood in Feng Shui system. Wood element is related to plants and greenery and life and that cycle of life. Water is actually related to the color black, which is depth of wisdom. If you think about an ocean, if you’re out in the middle of the ocean and you’re looking at the water, you actually see black. There’s so much going on underneath, and you can’t see what’s happening underneath but there’s a lot of motion and a lot of activity deep in the ocean, so that’s where black comes from. Now, these were all from the Chinese Feng Shui, ancient…how far back does this map go? I mean, just curious about the origins of it and what the thoughts of the ancient Chinese people were when they, whoever, developed this. Well this Feng Shui bagua map that I use is a newer map so it’s I don’t know how many thousands of years, but it is quite old, but there was one before that called the former heaven bagua, and I don’t think I’m qualified to talk about it today, because it’s really complicated, but it’s a little bit different. It’s a little bit different, but water is also related to this black area of the bagua map which is related to your career and your path in life and how you move through the world. In China, they wear white and they wear black at weddings, or they used to. So black is the absorption of all colors, and white is actually the reflection of all colors, so white is almost absence of color where black incorporates all color. So it makes sense that it’s knowledge and depth of knowledge because it’s absorbing all the energies to create that black. They have good fire chi, yeah. It’s how the world sees you and how people recognize you. It’s your reputation and how you appear to others. Yes. Are you wearing any red lingerie today? I’m not even, I’m actually wearing black and blue. I don’t know. Actually there’s fashion Feng Shui too, how it affects your clothes. So the blue is actually very, it’s like a royal blue, but I would say with the black, you’re dressed very water. I’m water? I like the water. Born in August, I like the water. So this information is in the book and there’s also a lot of tips in the book. Could we go over a couple of tips for people to be conscious of saving and reducing and things that they should be looking out for in terms of what they need to do to make their carbon footprint a little less as well? Sure. My book is about really simple things to incorporate Feng Shui and green design in to your home. So one is that you could stop using bottled water and to get a filter in your home. I love to get the seltzer machines so you don’t have all those seltzer bottles. That’s one really easy way. Another is to look in to getting a green energy provider into your home so you’re not just getting the regular dirty energy but you’re putting your dollars towards renewable energy like wind energy. Anything like them, they have similar companies out there so that’s really important. What other tip can we have for the spring? One more. One more. To refresh your space by getting rid of 9 things in your closet. 9 things in your closet? Yes, 9 things. Can you do it? Once you move 9 things out of your closet, I promise you, things will start moving in your life. Okay, I’m going to start doing that, because I need to be moving. So those were some tips. I hope everyone jotted all those things down and we’ll jot them down, and Anjie, thanks for being here. Okay. We’ve been talking with Anjie Chi, founder of Holistic Spaces, Feng Shui practitioner and designer as well as a LEED certified architect. 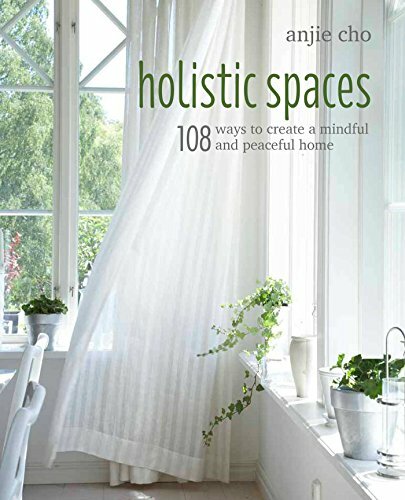 Anjie has written a new book entitled 108 Ways to Create Holistic Spaces which is available on amazon.com and you could also go to, what’s your web? AnjieCho.com with a J, A – N – J – I – E – C – H – O.com or holisticspaces.com. Okay, I wanted to get that in there. So this book will definitely help you lead a greener and more balanced life, which is good for the soul. So thanks for joining us for The Many Shades of Green. Maxine Margo Rubin has been involved with the media business as a content producer and part-time co-host for Air America (Marc Sussman’s Money Message), and hosted and produced Village Green on WDFH, a show which focused on topics of environmental sustainability and progressive social issues.